It begins with a crispness in the air with tinges of gold and vibrant red decorating the leaves of the trees. As the long summer days come to an end, pools close up and long sleeves are drug out of the backs of closets. Before you know it, fall is in full swing with the crunch of the leaves under boots, cravings for warm and hearty soups, and lines of patrons inside cafes waiting for their pumpkin spice lattes. With the changing of the seasons comes a myriad of home maintenance tasks. Outside, homeowners tuck their summer tools and patio furniture away, prepare the landscaping for below-freezing temperatures, seal cracks and clean gutters. Inside, air ducts are cleaned and furnaces and chimneys are inspected and serviced for use. Whether you own a brand-new build or a 1900s bungalow, follow this checklist of eight home maintenance musts to successfully ready your home for the fall and winter seasons. Before the snow begins to fall and the ground freezes, preparing the yard is a vital fall task. Spread fresh mulch around shrubs and trees, remove dead and dying plants and flowers, wrap vulnerable shrubs or place them under plastic pots, and rake fallen leaves. These efforts will protect your plants through the below-freezing days and nights and make for a much easier landscaping job come spring. In order to preserve the quality of your outdoor furniture, it’s ideal to cover and/or store it inside a shed or garage during the months of nonuse to protect it from the elements. And after completing yardwork, store away any gardening tools to avoid rust. Freezing temperatures can crack pipes, faucets and hoses. An important fall maintenance chore is to ensure all outdoor hoses are unhooked, drained and stored away. Faucet covers and freeze caps are a great investment to protect the faucet and piping from freezing water, and it’s ideal to turn the outdoor water source off completely before temperatures reach too low. Before you kick up the thermostat for the season, thoroughly inspect your home’s windows and doors for cracks. Repair any identified cracks, or hire a professional to do so, in order to maintain a more consistent temperature throughout the home and keep your heating bill as low as possible. Especially for aging homes, fall roof inspections should be conducted annually and vulnerable areas promptly addressed. The heavy snow and snow melt can cause havoc to a damaged roof, and no homeowner wants to face a roof repair in the middle of winter. 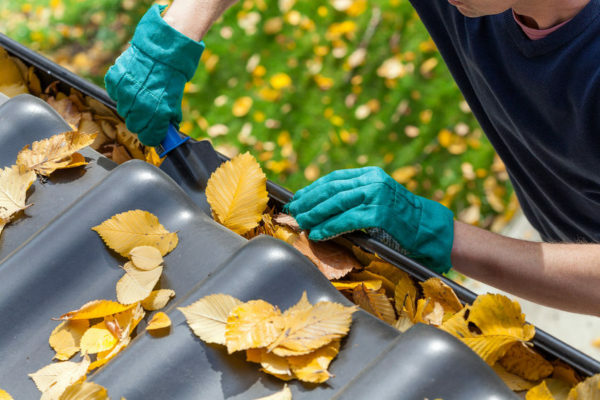 Additionally, gutters should be cleared of leaves and debris before winter weather arrives. In the dead of winter, one of the last things homeowners want is for their furnaces to call it quits. Annual maintenance checks are recommended by HVAC technicians in order to ensure furnaces are working properly and no carbon monoxide leaks are present. Opting to have your furnace serviced annually also extends the life of the unit. As the thermostat setting switches from air conditioning to heating, the fall season is the ideal time to hire a professional company to clean the air ducts. Not only will this service clear the dust from your central heating and cooling paths, but it improves airflow and helps keep energy bills low. A chimney should be properly cleaned annually, especially if used on a regular basis during winter months. If this task isn’t a part of your spring cleaning checklist, it should definitely be included on the list for fall. A professional chimney sweep is able to clean the sides of the flue of creosote buildup and ensure there are no obstructions. Having this service done before the cold-weather season helps ensure fireplace safety.